Today, we’re going to walk you through our picks for best gaming motherboards. Heading into 2019, you’re going to want to pick nothing but the best for your system: fortunately for you, nothing but the best made it into this roundup! With extensive testing and research, we’ve made a selection of twelve great motherboards for you to choose from. We’ve included all of the information you need to make an informed purchase in this article, as well as our own thoughts on each motherboard. But enough of the introductions: let’s hop into it! 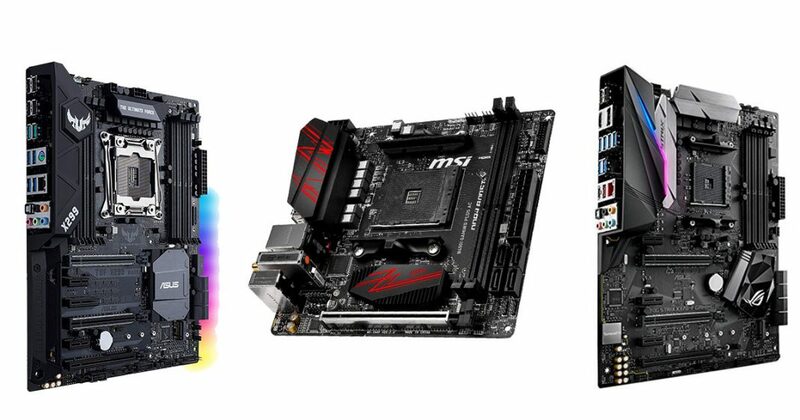 Any of these motherboards tickle your fancy? Go and check out our best PC cases of 2019 roundup to find the right case to go with it! 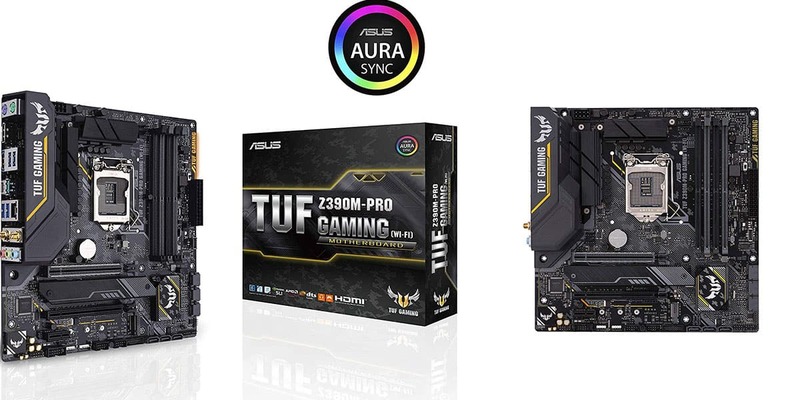 The ASUS TUF Z390M-Pro Gaming is the best Micro ATX Motherboard that we were able to find. 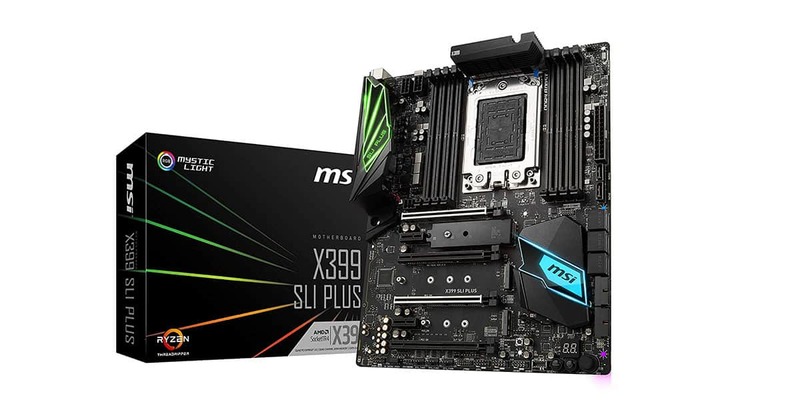 It’s also a contender for best Z390M motherboard, thanks to its abundance of extra features. The basics of what you’d expect from this board are all here- high RAM speeds, 3.1 Gen2 support, overclockability. In addition to these expected benefits, there is also Type-C support, high-speed M.2 support, and even RGB! Arguably the best extra feature of it is the included Wi-Fi and Bluetooth support. 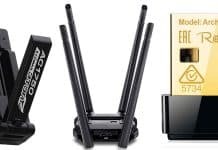 The motherboard ships with two antenna and corresponding antenna ports to utilize these wireless technologies, meaning your PC is ready for these functions out of the box. This is particularly important for a Micro ATX PC that’s frequently on the move. If you’re looking for a corresponding case for this motherboard, check out our article on Micro ATX cases! As much as we like this motherboard, we have to concede: nothing in this world is perfect. In this case, the biggest problems are in the motherboard’s pricing…and the BIOs. Some genius at ASUS thought they should ship this motherboard with Secure Boot enabled by default in the BIOs, which means you won’t be able to start using your PC until you dive into the BIOs and disable it. This is an unfortunate downside to the building process, and we aren’t totally sure how it got past ASUS. It’s ultimately a minor inconvenience, though, and we don’t think it should stop you from picking this one up. Also, there are some…interesting decisions in ports. Despite this being a high-end gaming motherboard, there are two motherboard display ports taking up space that could be used for additional USB expansion, as well as two PS/2 connectors that could be downsized to one. There’s hardly a shortage of USB here, but this is still a strange design decision. 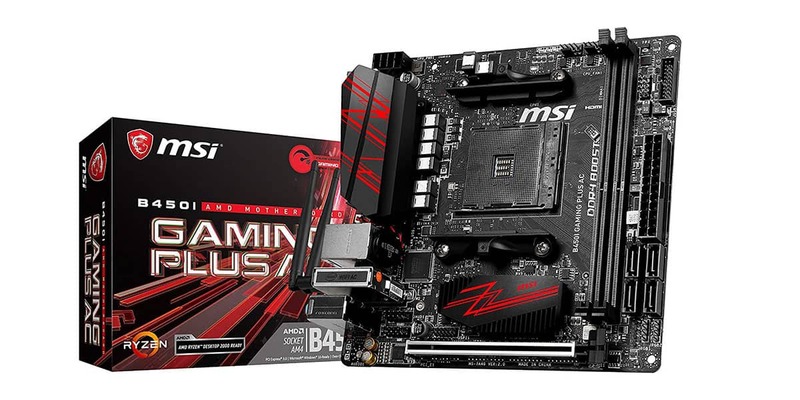 Our pick for best Mini ITX motherboard is MSI’s B450i Gaming Plus, boasting overclocking support for the latest Ryzen processors and a fairly plentiful USB port setup. If you’re looking to make your own SFF PC or console-killer build, AMD’s chipset is going to be a pretty good match. While AMD may not quite have the single-core performance of Intel processors, this makes little difference in real-world gaming performance, especially if you’re using high-end GPUs and playing at high resolutions. The B450i Gaming Plus includes Wi-Fi and Bluetooth support, as one would expect from a high-end ITX motherboard. The included antennas help ensure that these experiences are of genuinely high quality, meaning that once you’ve gotten everything setup you’ll be able to enjoy a genuinely wireless gaming experience. Aside from the wireless support and expected chipset features, the B450i is remarkably well-built and sturdy for a Mini ITX motherboard. It’s very compact and somewhat difficult to build with, but this is true of all ITX boards, and not something to penalize this one in particular for. Interested in this motherboard and want a corresponding case? Check out our picks for best Mini ITX case! Our only real problem with this motherboard is the M.2 support. Don’t get us wrong: it supports high-speed M.2 like you would expect a high-end motherboard to. However, if you take a look at the product images…you may notice a lack of an M.2 slot on the surface. That’s because the M.2 slot is on the back of the motherboard. This adds an extra layer of complexity to the motherboard installation process, when ITX is already the toughest form factor to build with. While we understand why this compromise was made, it’s still a pain to deal with. 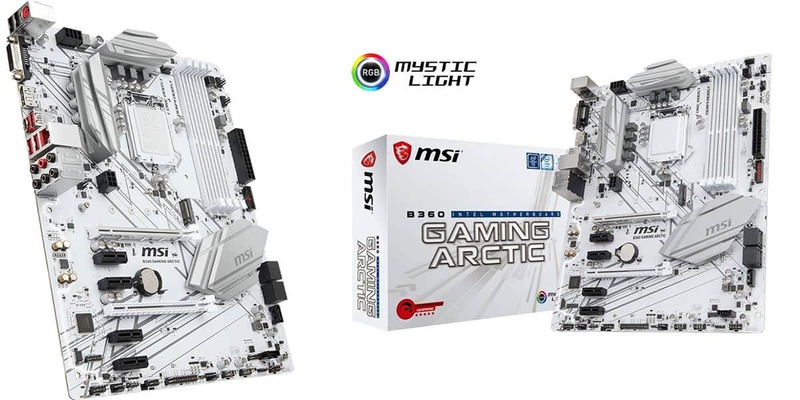 Our pick for best B360 motherboard is MSI’s B360 Gaming ARCTIC. Let’s start with the obvious: this board looks great. The ARCTIC naming designation is for its white body, which contrasts nicely with black ports and connectors. Depending on how you set up the rest of your PC build, you can create something that looks truly striking with the assistance of this motherboard. Aside from the aesthetics, this is a budget board packed with a ton of features. USB 3.1 Gen 2 and Type-C are both supported, which is almost unheard of in this price range. Additionally, high-speed M.2 configurations are supported, as well as…DVI, for some reason. Yeah, this board has an integrated DVI connector for some reason. 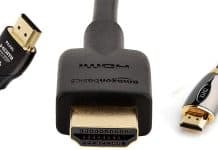 In addition to the DVI connector, there is also a DisplayPort connector. These are both arguably less popular than HDMI, so why they were both included instead of an HDMI port is a very curious decision. Additionally, they both occupy their own real estate on the I/O- they aren’t stacked, which takes away room that could be used for more USB ports. Seeing as this isn’t a Ryzen APU board, we don’t understand the focus on embedded video instead of more USB expansion. Even if you are focused on embedded video capabilities- why forgo HDMI for DVI? In addition to this downside, there are two more meaningful issues. There is only one M.2 slot, despite this being a full-sized ATX motherboard- this is a downside for enthusiasts seeking to run multi-M.2 SSDs. Additionally, there’s no overclocking support…but since Intel is very stingy with this feature anyway, we aren’t very surprised. 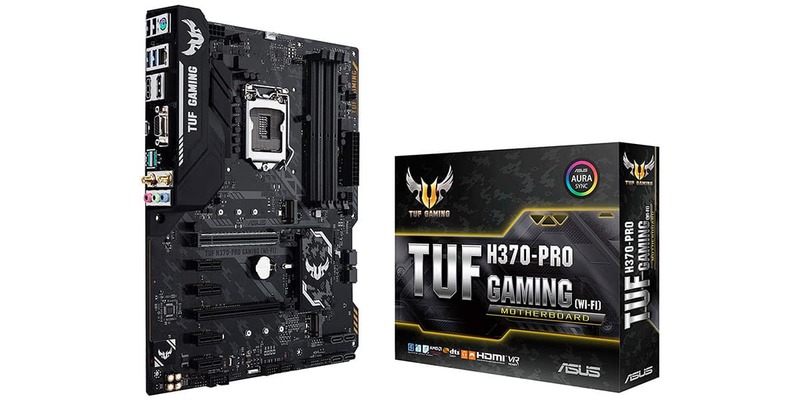 Now for the best H370 motherboard, the ASUS TUF H370-Pro Gaming! With a name as big as that one, this board lives up to expectations with big expansion and big features. For instance, this is actually the only Extended ATX motherboard on this list. It puts that Extended ATX designation to good use, however, offering a ton of extra headers for fans and AIO pumps. The extra board space also seems to allow for an enhanced I/O, featuring USB 3.1 Gen 2, Type-C, and a general abundance of USB ports. There’s even built-in Wi-Fi, with two antenna ports (and a wired antenna) you can use to amp up those capabilities! There’s no arguing: this is a pretty dang full-featured gaming motherboard. With the dual high-speed M.2, built-in Wi-Fi, extended USB expansion, and general build quality…it’s unmistakable. However…this board doesn’t support overclocking. 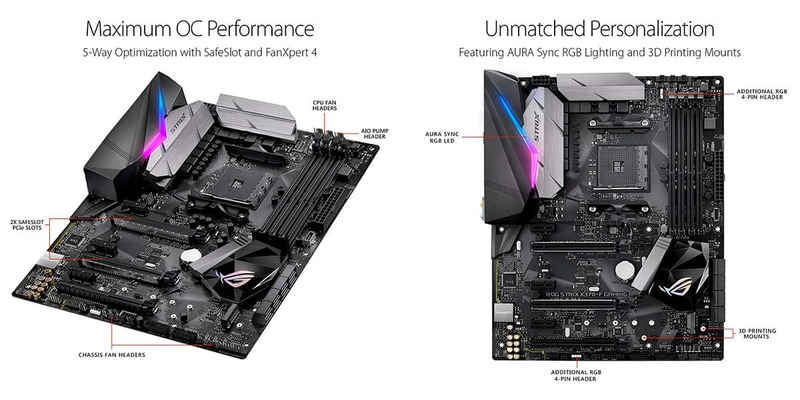 In truth, this board is actually a stripped-down version of ASUS’ higher-end TUF Z370 motherboards, which enable overclocking capabilities and have the same general set of features. While the lower-end chipset does let it come in at a much lower price, it also comes at a key downside for PC gamers, especially overclocking enthusiasts. Additionally, its extended ATX form factor will make it a harder fit in some cases. We recommend Full Tower for this one, just to be safe. If you have the extra money to spend and want the best out of your Intel processor, our pick for best Z370 motherboard is a natural pick. 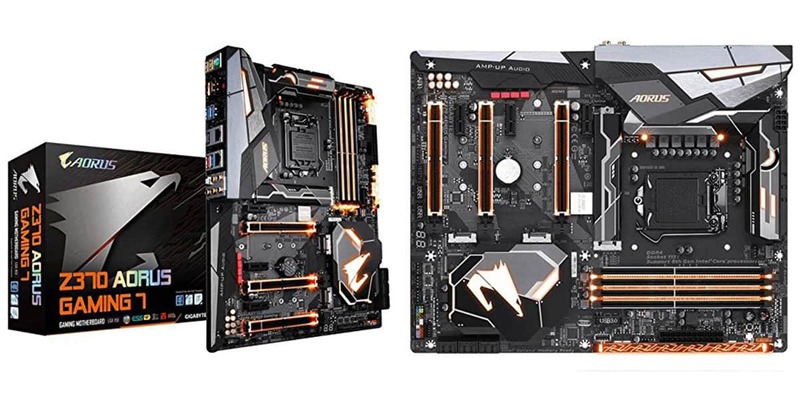 This is the Gigabyte Z370 AORUS Gaming 7 , the most highly-rated Z370 motherboard on Amazon, and a favorite among enthusiasts in general due to its stellar build quality and feature set. First and foremost, yeah- you can overclock with this one. If you’re an Intel person and the most important thing about the motherboard is if it overclocks, you can go ahead and narrow down your choices to this one and the next. Aside from overclocking support, there are also quite a few more appreciated features included on this motherboard. A look at the back panel I/O will show off 6 USB Type-A ports, one of which is 3.1 Gen 2, the rest of which are 3.1 at least. There’s also a Type-C port, which is also 3.1 Gen 2, offering the best compatibility with Type-C devices to your PC. Taking a look at the body of the motherboard, you’ll also notice a whopping three well-placed high-speed M.2 slots and prominent RGB lighting. The overall build quality is also quite high, arguably the best on this list so far. However…there are a few minor issues. Most major is the price. The ability to overclock with these features is going to cost a pretty penny, so you’d better be ready to shell out for it. Availability is also somewhat limited, which drives the board’s price higher. Aside from that, there’s a little nitpick: one LED on this board will always be red, regardless of what you’ve configured the rest of your build with. It doesn’t outright conflict with the other colors, but if you’re very serious about your RGB, this downside is worth noting. This is our pick for best Z390 motherboard- nay, best LGA1151 motherboard overall. Whether you’re running 8th or 9th gen Intel chips, this is the most fully-featured, high-quality motherboard you’re going to find on the market. First and foremost, there’s overclocking. 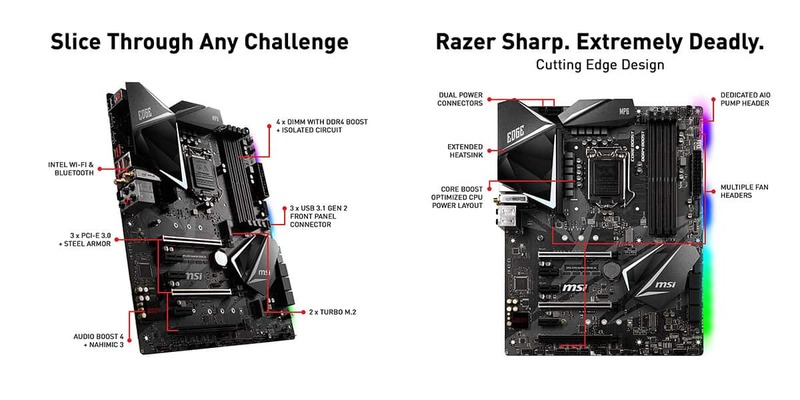 Z370 and Z390 are rather similar, as their designations imply- the difference is that Z390 supports 9th Gen out of the box, and comes with a few more extra features you might appreciate. For instance, this motherboard supports Wi-Fi and Bluetooth out of the box, including an antenna setup to utilize these to their fullest. Those of you using USB 3.1 Gen 2 devices will also be delighted to know that this motherboard has a Type-C Gen 2 port on the back, and multiple headers for it on the motherboard. For the storage-oriented among you, there are dual high-speed M.2 slots, allowing you to make the most of your M.2 SSD setups. Each PCI Express lane is a full 3.0 as well, meaning that mulit-GPU and multi-SSD setups will be able to make the most of their speed with this board. Aside from those features, there are also extra fan headers and an AIO pump header for enhanced cooling potential. Finally, this package is completed with amazingly solid build quality and RGB backlighting. Namely…who decided that a high-end gaming motherboard should only have 5 USB Type-A ports? Who then decided that we needed two full-fat HDMI and DisplayPort embedded? Nobody is using onboard video with Z390 boards! There’s no point! Aside from the USB port conundrum, this one is also pretty expensive, but may actually be less expensive than our Z370 pick sometimes. These issues aren’t deal breakers: this is still a ridiculously fully-packed motherboard, and for that reason, we recommend it highly. There is a power beyond Z390. This is our pick for best X299 motherboard, for the madmen among you running Intel Core i9 processors. First and foremost- yeah, you can overclock with these. Since these pretty much exclusively support X-series CPUs, there shouldn’t be a configuration where you can’t overclock your system to your heart’s content. In terms of features aside from overclocking, you have abundant ports, expansion, and RGB. The ports are our personal favorite- this board doesn’t bother at all with embedded video ports, so there is plenty of USB 2.0, 3.1, and 3.1 Gen 2 ports on display here. It’s refreshing to see a motherboard finally get that message. There are also dual high-speed M.2 slots, and a rather flashy implementation of the aforementioned RGB lighting to appreciate here. If you’re looking for an X299 board, this is truly your best option. However…the price doesn’t quite match what you get. While you do get an X-series motherboard with overclocking capabilities, you’re also missing out on a lot of the features you’d get with a high-end Z390 motherboard…and you’re paying more for it! This is less of an individual motherboard problem and more of an Intel problem. It’s obvious to any serious enthusiast that Intel’s i9 processors and chipsets are kind of…rushed to compete with Ryzen Threadripper, and it makes them a bit poorer of a value proposition overall. This is still the best X299 motherboard, but if you haven’t decided for sure on your CPU…you may want to consider Z390 instead. 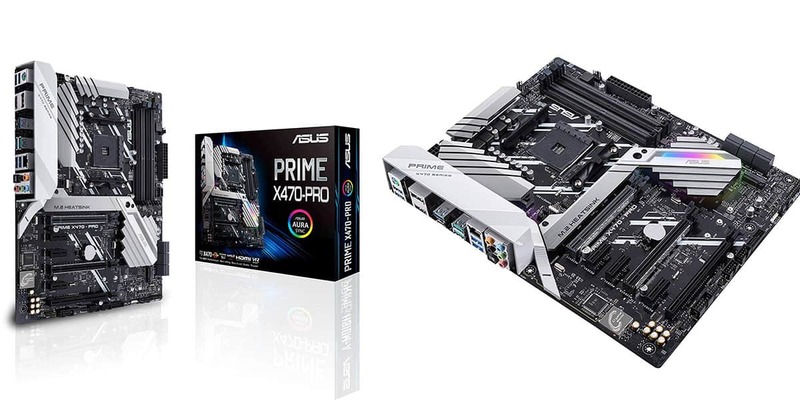 The ASUS PRIME A320M-K is our pick for best A320 motherboard, thanks to its excellent value pricing for budget Ryzen-based systems. The main benefit of this board is its solid build quality. When shopping for budget motherboards on low-end chipsets, it can always be scary, especially if you don’t know what to look for. While this board is fairly barebones and doesn’t have extra features of note, it does come with that ASUS guarantee of quality, and our own experiences with it were positive. You’ll need to update this motherboard’s BIOs before you can run 2nd Gen Ryzen CPUs with it. If what you’re looking for is the perfect budget motherboard for a Ryzen APU builds, you may walk out of this one feeling disappointed, since it doesn’t always ship with the BIOs update applied. Additionally, the USB 3.1 support is limited to front panel USB, and there is no built-in Type C or Gen 2 support on this motherboard. This is an older, budget solution, though, so that kind of makes sense. All that being said, the first-gen Ryzen processors have aged extremely well and you can find them for pretty good prices on and off of the used market. For that reason, this is still a fairly potent board, and one worth buying if you’re a savvy budget user. 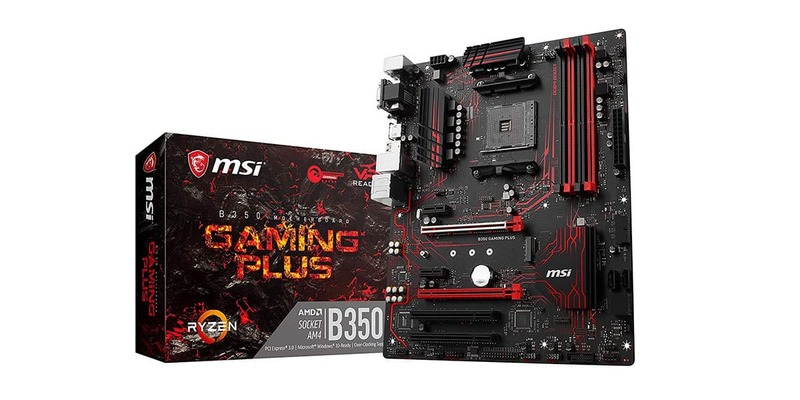 The MSI B350 Gaming Plus motherboard is our top pick for best B350 motherboard and a fairly solid leap over its A320 counterpart. If you can afford to spend just a bit more on your motherboard, you’re going to get a lot in return here. First and foremost, say hello to out-of-the-box 2nd Gen Ryzen support. As long as you have an AM4 Ryzen processor, congrats: this motherboard will work for you, whether you’re buying a new 2200G or a used 1500X to go along with it. In addition to the enhanced Ryzen support, this board also offers USB 3.1 and Type-C support, ensuring compatibility with your devices. It may not be quite as fast as 3.1 Gen 2, but it should still provide a fairly solid experience for the low price you’re paying. You can also overclock with this one! AMD is…considerably less stingy about allowing overclocking on its boards, though word on the street is that B350 overclocks can be a bit more limited than X370 overclocks. How much of a meaningful difference this actually makes, we aren’t sure, but it is worth noting. In addition to the aforementioned features, there’s also high-speed M.2 support and some embedded red LEDs for extra visual flourish. While this is a genuinely stellar board, especially for its price, there is always a catch. Namely, BIOs issues. 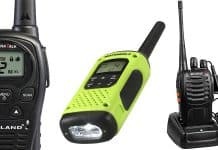 While these have been mostly alleviated since the board’s launch earlier in 2018, there are still a few examples of users reporting issues in recent months. We highly recommend that you update your BIOs as soon as you get this PC, before you even install your OS, if possible. Additionally, some users report overheating with their M.2 drives when the GPU is mounted above it. While we didn’t experience this issue ourselves, we recommend keeping this in mind if you’re an M.2 enthusiast. Now we’re getting to AMD’s high-end chipsets, and we gotta say: they aren’t disappointing. The ASUS ROG STRIX 370-F gaming is our top pick for best X370 motherboard and a big favorite among fans of AMD Ryzen. First of all, this board offers full overclocking support and stellar build quality. If your main interest is pushing those Ryzen clocks as far as they can go, this board may just be the right one for you, especially if you enjoy other high-end features. Aside from the obvious overclocking, there are a lot of other benefits available here, too. For instance, this board is loaded with USB ports…there’s 2 2.0 ports, 1 3.1 port, 1 3.1 Type C port, and six 3.0 ports, which is pretty nice. There are also embedded DisplayPort and HDMI ports, which don’t get in the way of the USB and actually make sense since an APU build would work well with this board. Aside from your ports, you have some RGB lighting, an extra RGB header on the motherboard, and even 3D printing headers, for some reason. 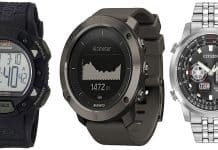 This comes alongside generally-stellar build quality and high-speed M.2 support. While this shoots high to be the best AMD motherboard, it doesn’t quite hit the mark due to a few issues. First and foremost, there are occasional BIOs issues reported by users, especially around the early launch window. While we didn’t experience these and they seem to have calmed down significantly since then, we still need to point it out. Additionally, this board is pretty expensive. Not quite as expensive as its Intel counterparts, but…it’s still up there. If you’re looking for the best Ryzen motherboard, then our pick for best X470 motherboard might be the right one for you. 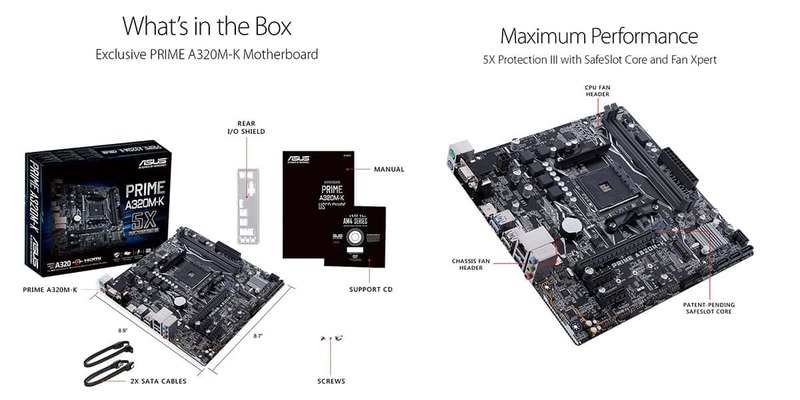 This is the ASUS Prime X470- a big board built to take advantage of 2nd Gen Ryzen processors and push them to their limits. First and foremost, there’s overclocking. Overclocking on this board should be a breeze, especially with ASUS’ onboard software making it easier than ever. You’ll still get better results doing it all yourself, of course, but this motherboard can get a pretty easy overclock, even for inexperienced users. Next up, let’s look at the ports. You have 5 USB 3.1 ports, 2 USB 3.1 Gen 2 ports, and even a Type-C port! Your USB needs are pretty well-met here, and if you’re running an APU, the included DisplayPort and HDMI connectors should also make you very happy. In addition to these features, you have what’s expected out of a high-end motherboard these days. RGB lighting, high-speed M.2 support (with a heatsink for one of them! ), and stellar build quality are all on show here. However…there is a problem, specifically with the M.2 support. Namely, the M.2 heatsink is occasionally screwed too hard into the motherboard. This isn’t a universal issue, and you may be able to get ASUS to fix the problem for you if you report it to them, but it’s still notable. Quite a few users have reported issues with the tight screw, resulting in the heatsink needing to be discarded entirely or for a different slot to be used. Since this is a central feature of the motherboard, it’s a sad problem for it to have. Last but certainly not least is the MSI X399 SLI Plus or the best X399 motherboard. If you’re running Ryzen Threadripper, this is the best possible choice for your money…at least out of what’s currently available. First off, and this may go without saying, but you can overclock on this board. With Threadripper’s ridiculous core and thread count, that translates to a truly incredible amount of multicore power at your disposal, which will make multi-threaded applications a breeze. This is the board where AMD’s best gets to shine with no limitations whatsoever. You may also notice that there are eight DIMM slots on this one. That means, yes, you can run some truly ridiculous memory configurations with this board, which will help push your Threadripper CPU even further. There is also ECC memory support, for professionals who need that. Aside from the aforementioned pure power features, there’s triple high-speed M.2 support and RGB lighting, for just a little bit of extra visual flair. The number of ports available is genuinely ridiculous, too- eight USB 3 ports, 2 USB 2.0, 1 USB 3.1, and Type-C. This is a fully loaded motherboard, and the best we were able to find for Threadripper. However…Threadripper motherboards have some problems. Namely, especially in early shipments, RAM and BIOs problems were quite frequent. While the former has been cut down on quite a bit more recently, the latter still persists…you want to update the BIOs on this one the moment you’re able to, essentially. We don’t recommend using the stock BIOs for any extended amount of time if you can avoid it. Aside from that, this board is also expensive. Probably the most expensive on this lineup. But then…nothing else on this lineup supports Threadripper, so that’s a fair tradeoff, right? In this section, we’re going to walk you through the selection process of picking a motherboard. Whether you’re starting fresh with a new PC build or already have the rest decided, we hope that this section helps you. First and foremost, the elephant in the room: compatibility. When buying a motherboard, you need to think about at least two other components in your system: your CPU and your case. In some cases, you may also need to think about RAM (do you have enough RAM slots? ), drives (is the board M.2 or RAID compatible? ), and other factors. For now, we’ll focus on compatibility. First and foremost, every motherboard has a CPU socket and corresponding chipset. LGA1151 – Used by Intel desktop CPUs since 2015. AM4 – Used by AMD Ryzen CPUs since 2017. LGA2066 – Used by Skylake-X and Kaby Lake-X processors since 2017, primarily for server purposes. SP3 – Used by AMD Epyc Server processors. TR4 – Used by AMD Ryzen Threadripper desktop processors. This usually corresponds perfectly to compatibility, except in the case of LGA1151. Despite the physical slot being the same across multiple generations, the boards and CPUs usually aren’t cross-compatible: 6th Gen Skylake processors, for instance, won’t work on motherboards made for 8th Gen Coffee Lake processors. Some 7th Gen Kaby Lake motherboards can work with Coffee Lake processors, but only after a BIOs update. In these cases, it’s always smart to check Amazon reviews to see if boards are being shipped with these updates. If they are, you get to save a few bucks- otherwise, you’ll want to just buy an up-to-date motherboard. Chipsets are a much safer way of gauging compatibility, but more complex. Chipsets determine not only compatibility but access to features like overclocking and more- we’ll discuss those in more detail later in the article. For now, let’s move onto size. If you want a more detailed rundown of motherboard size, especially how it relates to case size, click here to read our gaming PC case guide. For a briefer explanation, keep reading. Below are the four motherboard sizes you’ll see in this article, alongside case compatibility and purpose. Mini ITX – Compatible with ITX cases and larger. Intended for SFF (small form factor) PCs, generally having only a single PCI Express slot for GPU mounting. Air cooling will also be tougher to pull off on these, since large heatsinks may conflict with RAM configuration. Micro ATX – Compatible with Micro ATX cases and larger. Not necessarily intended for SFF PCs, but still much smaller than its ATX and EATX contemporaries. Generally cuts down PCI Express slots to 2, making dual-GPU setups…possible, but difficult depending on motherboard configuration. Air coolers fare better here, but you may still encounter RAM clearance issues on select boards. ATX – Compatible with Mid Tower ATX cases and larger. This is your “default” motherboard size, and it’s made with anywhere from 3 to 4 PCI Express slots. Cooler clearance generally won’t be an issue here, and you may also have more RAM slots (up to 8!) available with some boards. Extended ATX – Mostly the same as ATX, but…extended. In what way varies on a case-to-case basis, but you should generally opt for a compatible Full Tower to be safe. These are the basics of motherboard size and how they correspond to chassis. Keep reading for a rundown of other important features. While motherboards generally won’t have a big effect on your gaming performance, there is one factor where they can: overclocking. Specifically, whether or not the board in question even supports overclocking. Below, we’re going to list modern chipsets and their overclocking status. In the case of Intel motherboards, you’ll also need a -K or -X series CPU to overclock. All AMD processors are overclockable, just not by every AMD motherboard. Now, we’re going to list common CPUs and compatible chipsets. AMD Ryzen 2000 Series – All AM4 socket chipsets…with a BIOs update. Otherwise, B400/X400 required. If you’re ever unsure about whether or not a CPU is supported, the best practice is always to check the manufacturer’s website to be sure. Even with AMD’s relatively-simpler chipset/socket setup, CPU and motherboard compatibility has always been a little bit of a headache to keep track of. This one is pretty important- can your motherboard actually support all the RAM you’re slapping into it? First, you’ll want to observe how many RAM sticks your motherboard can physically support. With most modern motherboards, regardless of size, this is at least 4 slots, making quad-channel memory configurations possible. A few ATX and EATX motherboards double this number to 8, allowing for even greater memory installations. Next, you’ll want to find out what speed your motherboard supports. The chipset has an effect on this, but you’re still going to want to check on a case-by-case basis. If you’re having difficulty locating this spec, heading to the manufacturer’s site is usually the best option. 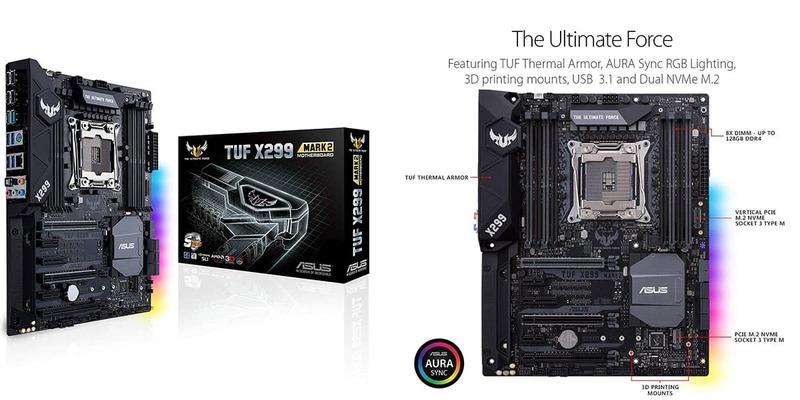 For instance, the TUF Z390M-PRO GAMING listed above doesn’t have this information on its Amazon page. Heading to the manufacturer’s specifications page, however, reveals that it supports up to DDR4-4266, which is pretty hefty! Since modern motherboards use DDR4 RAM as a baseline, you generally won’t need to worry too much about RAM speed in gaming and day-to-day applications. However, if you want to make the most of the RAM you do buy, make sure the motherboard is equipped to handle it. Wi-Fi and Bluetooth used to only be available via USB adapters or PCI expansion, but in recent years many motherboards have started building these capabilities in. This is very much a per-motherboard issue, and things like chipset or socket won’t usually have an impact on compatibility with these features. You’ll see these features most frequently- and most necessarily- with Micro ATX and Mini ITX motherboards. Since these are made for smaller, more portable PCs, these features become more desirable. Additionally, the cutdown on PCI slots means that you want little or none used on non-GPU expansions. Another factor to take into consideration is USB ports and I/O. I/O stands for “Input/Output”, and in this context, refers to the I/O protruding from your motherboard and the back of your case. USB – USB, or Universal Serial Bus. This has become by far the most popular form of I/O for PCs and electronic devices in general, including smartphones and gaming consoles. This is what you’ll be using most, and what will be most available on your motherboard. Modern motherboards support the faster USB 2.0 standard as a baseline, with some others starting at 3.0 and going as high as 3.1/3.1 Gen 2, which are all correspondent with speed increases. PS/2 – This name comes from classic IBM machines, and is a connector used for classic keyboards and mice. USB has taken over for PS/2 in recent years, but many purists still prefer using PS/2 with their systems…and so, just about every motherboard available today still has them. DisplayPort – Port used for high-definition video and audio. HDMI – Port used for high-definition video and audio, sometimes slower than DP. DVI – Port used exclusively for high-definition video. VGA – Port used for standard-definition video, generally unable to push past 1080p in the best case scenarios. Ethernet/RJ45 – Used for hardwired Internet connections, ideal for reducing latency and increasing speed. Antenna Ports – Most often used for built-in Wi-Fi and Bluetooth chipsets to extend range and reliability. Audio Ports/Optical Audio – Used for traditional audio systems. In general, the more ports = the more channels for your speaker system. In recent years, contested by HDMI, DisplayPort, and USB audio capabilities. Usually, the biggest difference between motherboard form factors will be the number of PCI slots available for expansion. Other forms of expansion, like SATA and M.2 (for drives), can also be impacted by downsizing. We’re going to explain each of the expansion slots that may be affected below. PCI/PCI Express – PCI slots are for basic expansion, generally the addition of sound cards or extra USB ports. PCI Express slots are larger and account for larger expansion- most prominently, a discrete GPU, which is vital for any serious gaming machine. Multiple PCI Express slots allow for multi-GPU installations, but these have fallen out of favor due to the poor manufacturer and game support in recent years. The fastest SSDs (solid state drives) may also require available PCI Express lanes. SATA – SATA (SATA III 6 Gb/s on modern boards), is used by traditional hard drives and most SSDs in modern systems. The 6 Gb/s bandwidth is well above the capabilities of your typical hard drive, but perfectly in line with that of your average SSD. M.2 – M.2 is used primarily by SSDs, which are able to be made even smaller when in the M.2 form factor. Depending on the implementation, M.2 will use the bandwidth of either a SATA connector or PCI slot- for high-performance M.2 drives, you’ll want to make sure it’s the latter. DIMM slots – DIMM slots are for DIMMs or dual in-line memory modules. In other words, your RAM sticks. The more DIMMs, the more you can expand your memory. Most motherboards will only support 4 slots, however. Some motherboards may come with extra features that don’t really have any impact on expansion or gaming performance. In most recent years, this comes in the form of RGB lighting support. If your motherboard supports RGB- and a few boards on this list do- you’ll be able to sync its lighting setup to other RGB components on your system. This provides an excellent unified lighting solution if showing off is important to you. Other extra motherboard features are usually much less impactful and seen most often in the form of included software. If the software is explicitly built to take advantage of your hardware- for instance, Intel Rapid Storage or XFast LAN- you should probably install it. Otherwise, you don’t really need to bother with any of it. For more details, scroll on up to corresponding sections on socket and chipset. This one is generally pretty simple. If you have a Mini ITX motherboard, Mini ITX cases and larger should be compatible with your system. However (and this applies especially for ITX and Micro ATX setups) you’ll want to make sure that other components, like your GPU and CPU cooler, are compatible with your case. Click here to access our 2019 Gaming PC Case Guide, which includes clearance measurements for the aforementioned components. If the chipset allows it, yes. Scroll on up to our section on chipsets to determine if this is the case for your particular motherboard. If you’re following our motherboard recommendations, we’ll also tell you in each motherboard review whether or not it supports overclocking. Does it have [X feature]? This information will usually be available on the Amazon page, and always available from the manufacturer themselves. With the motherboards we’ve listed above, we’ve listed every relevant feature that comes to mind- for more, head to the manufacturer’s site for the motherboard in question.